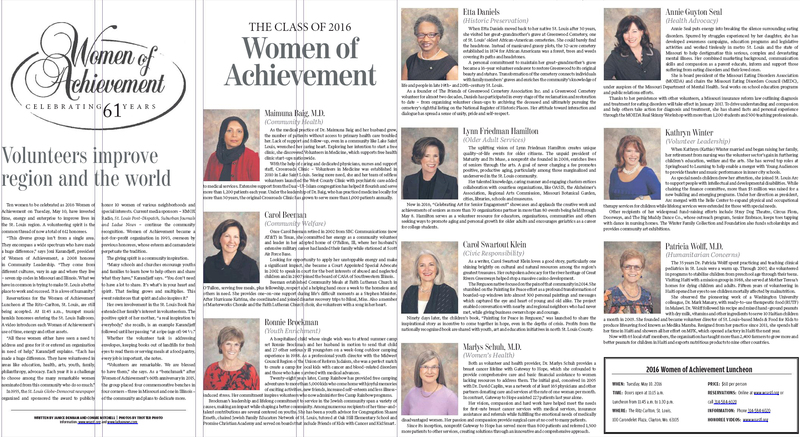 Women of Achievement - "2019 St. Louis Women of Achievement Announced"
Ladue News - "Presenting the 2019 Women of Achievement"
Ladue News - "Women of Achievement announces 2019 honorees"
St. Louis Post-Dispatch - "Women of Achievement group honors STL volunteers with 2019 awards"
St. Louis American - "Women of Achievement deadline is January 21"
Jewish in St. Louis - "Women of Achievement Announces Call for Nominations"
Patch - "Women of Achievement Announces Call for Nominations"
St. Louis Post-Dispatch - "Women of Achievement Announces Call for Nominations"
Ladue News - "Women of Achievement Class of 2018"
Jewish in St. Louis - "Marilyn L. Ratkin and Risa Zwerling Wrighton Named 2018 Women of Achievement"
St. Louis Post-Dispatch - "2018 St. Louis Women of Achievement Announced"
St. Louis Jewish Light - "Jews in the News: March 2018 - Marilyn Ratkin (social justice) and Risa Zwerling Wrighton (impactful leadership) will be honored..."
St. Louis Post-Dispatch - "Women of Achievement group names 2018 award winners"
Ladue News - "Nominations are now being accepted"
Ladue News - "Women of Achievement Annual Meeting and Leadership Transition"
Ladue News - "Elizabeth Mannen, ’I Read Ladue News’"
Ladue News - "A Survivor and a 'Thriver': Elizabeth Mannen"
Ladue News - "Nanci Bobrow, Ph.D., 'I Read Ladue News'"
Ladue News - "Susan Block, 'I Read Ladue News'"
Ladue News - "Ida H. Early, 'I Read Ladue News'"
Ladue News - "Claire Applewhite, 'I Read Ladue News'"
Ladue News - "Pam Toder, 'I Read Ladue News'"
Ladue News - "The New Top WOA"
Ladue News - "Lynn Friedman Hamilton, 'I Read Ladue News'"
Ladue News - "Women of Achievement Awards Luncheon"
Ladue News - "Claire Applewhite: Renaissance Woman"
Ladue News - "Digital Content: Women of Achievement Awards Luncheon”"
STL TV.net - "2017 Women of Achievement "
Gazelle STL - "Social Buzz: 2017 Women of Achievement Luncheon"
Ladue News - "Women of Achievement Luncheon"
Ladue News - "Women of Achievement Sponsor Appreciation Luncheon"
Starkloff Disability Institute - "Woman of Achievement - Colleen Starkloff"
KMOX - "Women of Achievement Profiles "
Town & Style - "The Insider: Meet the 2017 Women of Achievement"
KPLR - "Former KPLR news anchor named 2017 Woman of Achievement"
The Telegraph - "Women of Achievement honor Margaret Hopkins with Community Betterment award"
Stinson Leonard Street - "Stinson Sponsors the St. Louis Women of Achievement Award Luncheon"
Ladue News - "Gwendolyn Packnett, Ph.D.: I Read Ladue News"
Ladue News - "Meet the 2017 Women of Achievement (Print Edition)"
Ladue News - "Upcoming Gatherings: 2017 Women of Achievement Luncheon"
NCJW - "Meet the 2017 Women of Achievement: Marlene Hammerman"
Ladue News - "Meet the 2017 Women of Achievement"
STL TV - "2017 Women of Achievement: Interview with Christine Buck and Margaret Hopkins"
STL TV - "2017 Women of Achievement Honorees & Luncheon"
St. Louis American - "Adrienne Davis recognized by Women of Achievement for arts advocacy"
KWMU St. Louis Public Radio - "Adrienne Davis advocates for diversity in the arts"
JKS Communications - "JKS Client Claire Applewhite Recognized as a 2017 Woman of Achievement"
West End Word - "Women of Achievement to Honor 10 Volunteers May 16"
St. Louis Jewish Light - "Jews in the News: Marlene Hammerman will be honored at the 2017 Women of Achievement Luncheon on May 16"
South County Times - "Women Of Achievement To Honor 10 Volunteers May 16"
AdVantage News - "Hopkins to join this year’s Women of Achievement honorees"
Ladue News - "Wonder Women: Women of Achievement Class of 2017"
Ladue News - "Meet the Women of Achievement Class of 2017"
Jewish in St. Louis - "Marlene Hammerman Named 2017 Woman of Achievement"
RiverBender.com - "Woman of Achievement Johnetta Randolph Haley (Class of 1988) to receive the SIUE Distinguished Service Award"
Gazelle STL - "Women of Achievement Announces the 2017 Class of Honorees "
RiverBender.com - "Margaret Hopkins "very humbled" to receive St. Louis Women of Achievement Award"
The Telegraph - "Margaret Hopkins to receive prestigious St. Louis Women of Achievement award at May luncheon"
KMOX - "Save the Date: Women of Achievement Luncheon"
Ladue News - "Women of Achievement announces 2017 honorees"
St. Louis Post-Dispatch - "Women of Achievement announces roster of 2017 winners"
STL TV - "2017 Women of Achievement Call for Nominations"
Jewish in St. Louis - "Last Week to Submit Nominations for Women of Achievement Award"
Patch - "Last Week to Submit Nominations for Women of Achievement Award"
The Source - "WOA Lynn Friedman Hamilton and Maturity & Its Muse, "'Come Sing With Us’""
St. Louis Post-Dispatch - "Nominations Sought"
KMOX - CBS St. Louis - "Nominate an Outstanding Volunteer "
Ladue News - "Nominations are now being accepted "
Ladue News - "Women of Achievement's Annual Meeting and Celebration of Installation of 60th Anniversary Benches"
Ladue News - "Women of Achievement 61st Annual Luncheon"
Ladue News - "Women of Achievement Wants You"
STL TV - "Interview with Woman of Achievement Lynn Friedman Hamilton (Class of 2016) and Maturity and Its Muse"
STL TV - "STL Live: Women of Achievement"
Ladue News - "Women of Achievement Neiman Marcus Luncheon"
Ladue News - "Editor's Corner: Congratulations to Alice Handelman"
Ladue News - "Digital Content: Women of Achievement's Neiman Marcus Luncheon"
O'Fallon Progress - "O’Fallon advocate and volunteer receives Women of Achievement award"
Ladue News - "Women of Achievement Sponsors Appreciation Luncheon"
Blacktie Missouri - "Women of Achievment 2016 Awards Luncheon"
Alton Telegraph - "Gifts from Godfrey: Joan Sheppard"
O'Fallon Weekly - "Carol Beeman named 2016 Woman of Achievement"
Ladue News - "Digital Content: Women of Achievement Sponsors Luncheon"
Ladue News - "Upcoming Events: Women of Achievement’s 2016 Luncheon"
Town & Style - "The [In]Sider: 2016 Women of Achievement"
KTVI FOX2 - "2016 Women of Achievement Luncheon with Gwendolyn Packnett, Ph.D. and Ritz-Carlton, St. Louis Chef Tournant Damien Faure"
St. Louis Post-Dispatch - "Volunteers improve region and the world: The Class of 2016 Women of Achievement"
STL TV - "Interview 2 of 2 - Women of Achievement Vice President Gwendolyn Packnett, Ph.D. Announces the Class of 2016"
STL TV - "Interview 1 of 2 - Women of Achievement Vice President Gwendolyn Packnett, Ph.D. Announces the Class of 2016"
Ladue News - "Women of Achievement: Profiles of This Year's 10 Honorees"
West End Word - "Volunteers Honored by Women of Achievement"
Webster-Kirkwood Times - "Extraordinary Volunteers Honored By Women Of Achievement"
St. Louis Jewish Light - "Jews in the News: Ronnie Brockman and Lynn Friedman Hamilton"
Jewish in St. Louis - "Ronnie Brockman and Lynn Friedman Hamilton Named as 2016 Women of Achievement"
Ladue News - "Women of Achievement, Women of Style"
St. Louis Post-Dispatch - "Women of Achievement announces 2016 honorees"
KMOX - "2016 Women of Achievement Honorees Announced"
Ladue News - "Announcing the 2016 Women of Achievement"
KTVI FOX 2 - "Nominations sought for 2016 Women of Achievement Awards"
West End Word - "Women Of Achievement Accepting Nominations"
St. Louis Jewish Light - "Now is the time of year"
Diario Digital - "Women of Achievement busca nominaciones"
West Newsmagazine - "Women of Achievement nominations sought"
Jewish in St. Louis - "Nominations Sought for St. Louis Women of Achievement"
Ladue News - "Editor’s Corner: Do you know a woman worthy of praise?" Ladue News - "Women of Achievement announces call for nominations"
Ladue News - "Frankie Muse Freeman featured in Elite Advocates: A Champion of Civil Rights"
Ladue News - "Kimberly Ritter featured in Mission to Accomplish"
Saint Louis University - "SLUCare Neurologist Ghazala Hayat Named Woman of Achievement"
Ladue News - "Letter to the Editor from Women of Achievement President Nanci A. Bobrow"
Ladue News - "Past Women of Achievement Featured in Our Favorite Teachers: Lifelong Lessons"
Jewish in St. Louis - "Women of Achievement Group Announces 2015 Honorees"
Ladue News - "Women of Achievement 60th Annual Luncheon"
ALIVE - "ALIVE Q&A: 2015 Class Women Of Achievement Award-Winner Sara Burke"
Ladue News - "Women of Achievement 2015 – Photos from Luncheon”"
Blacktie Missouri - "Women of Achievement 2015 Awards Luncheon"
St. Louis American - "The STL Suite: Super Women Achievers"
St. Louis Magazine - "Party Pics: St. Louis Women of Achievement Award"
Ladue News - "May Charity Calendar"
Ladue News - "Celebrating 60 Years: Volunteers Make World of Difference"
St. Louis Post-Dispatch - "Women of Achievement’ Honors Faith Perspectives Blogger Ghazala Haya"
Belleville News Democrat - "Belleville-Area Woman Earns Special Accolade for Extensive Volunteer Work"
Ladue News - "2015 Women of Achievement"
STL TV - "2015 Women of Achievement"
St. Louis Jewish Light - "Recognizing St. Louis’ Women of Achievement"
Arts Today - "2015 Women of Achievement: Honoring the Region’s Outstanding Women Volunteers"
Ladue News - "April Charity Calendar"
Ladue News - "Women of Achievement 2015 Fashion"
St. Louis Post-Dispatch - "Women of Achievement Class of 2015 Announcement"
KPLR - "Women of Achievement Class of 2015 Announcement"
KTVI FOX2 - "Women of Achievement Class of 2015 Announcement"
Ladue News - "Sound the Trumpets! The Women of Achievement Class of 2015 Has Been Announced"
Ladue News - "Women of Achievement 60th Anniversary Celebration"
KMOX – Total Information PM - "The Women of Achievement Recipients (audio)"
Blacktie Missouri - "Women of Achievement 60th Anniversary Cocktail Celebration"
Ladue News - "Celebrating Women"
Ladue News - "Letters to the Editor"
KTVI FOX2 - "Nominations Sought for 2015 Women of Achievement Awards"
West End Word - "Jan. 5 Deadline for Women of Achievement Nominations"
Diario Digital - "Women of Achievement’: Reconocimiento al Voluntariado de la Mujer"
Arts Today Newszine - "Nominations Sought for Women of Achievement"
St. Louis Jewish Light - "Kibbitzing with Caplan: Women of Achievement"
STL TV - "Call for Nominations (Interview 2 of 2)"
STL TV - "Call for Nominations (Interview 1 of 2)"
Ladue News - "Society: Ladue Lips, “Call for Nominations"
St. Louis Post-Dispatch - "STL Sunday, Heads Up: Honoring Women"
St. Louis Magazine - "Glitterati: Women of Achievement’s 2014 Awards Luncheon, May 15"
St. Louis American - "Potpourri: Roberts celebrate Eva’s achievement"
Red Latina - "Mujeres de Logros"
Ladue News - "Women of Achievement: 2014 Awards Luncheon"
Ladue News - "2014 Women of Achievement Awards Pre-Luncheon"
Blacktie St. Louis - "2014 Women of Achievement Awards Luncheon"
STL TV - "Women of Achievement and the Class of 2014"
KMOV - "Powered by Hope,” story on 2014 Women of Achievement honoree Teri Griege"
St. Louis Jewish Light - "Jews in the News: May 2014"
CAM News: May 2014 - "Women of Achievement"
Ladue News - "May Charity Calendar: 2014 Women of Achievement Luncheon"
Ladue News - "Women of Achievement: Join the celebration to honor the 2014 Women of Achievement"
Doorways - "Doorways Board Chairperson Receives 2014 Women of Achievement"
Eden Theological Seminary’s StoryBoard - "Ida Early – A Woman of Achievement"
St. Louis Post-Dispatch - "Women of Achievement Announces St. Louis 2014 Honorees"
Ladue News - "Women of Achievement: The Class of 2014"
Ladue News - "Women of Achievement: Ladies, Take A Bow!" Washington University - "Virginia Braxs Named One of Ten St. Louis Women of Achievement for 2014"
St. Louis Post-Dispatch - "Women of Achievement Winners Named for 2014"
Ladue News - "The Recipients of the 2014 Women of Achievement Award Have Been Announced"
KMOX - "Carol Daniel and Mark Reardon Announce this Year’s Women of Achievement Winners"
Ladue News - "Top 10 Most Dynamic People of 2014: ‘Nanci Bobrow'"
Ladue News - "Women of Achievement: Nominations Are Now Being Accepted"
KMOV - "Women of Achievement Call for Nominations"
KSDK - "Women of Achievement Looking for 2014 Nominees"
Ladue News - "Memorable Moments, 2013 Honorees at the Women of Achievement Luncheon"
Ladue News - "Call for Nominations"
West End Word - "Women of Achievement Call For 2014 Nominations"
St. Louis American - "Women of Achievement Calls for Nominations"
KPLR - "Deadline Approaching for Nominating Women of Achievement"
St. Louis Jewish Light - "Women of Achievement Is Calling for Nominations"
St. Louis Post-Dispatch - "Women of Achievement Nominations"
KMOX - "Voices of St. Louis"
St. Louis Post-Dispatch - "St. Louis Memories, A Look Back, p. 171"